Rapper Akon made news years back when he told interviewers that he believes in polygamy, telling reporters that “I can afford to have as many wives as I can afford to have”. Over the years FOUR women have been referred to at one time or another as Akon’s “wife”. 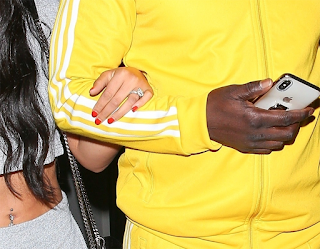 It’s not clear to us that Akon has divorced ANY of those women. Now here comes NUMBER FIVE. Akon and his new fiance were spotted out yesterday having a romantic PRE-PRE-Valentines dinner. We imagine that with Valentine’s Day just a day away, Akon is busy . . .
See a closed up photo of her engagement ring. Lovely or not?